I am so excited to share the Melissa and Doug Terrific Twenty List with you today! As you know, we love Melissa and Doug here at Toddler Approved... so we are super excited that they'll be giving away a new toy every day on the Melissa and Doug Facebook page for twenty days (starting November 6th)! Do you see any gifts on this list that you'd love to give to your kids for Christmas? In addition to winning over on the Melissa and Doug Facebook page, we are going to be giving away a special terrific twenty prize HERE on Toddler Approved!! 1. Mandatory Entry: Leave a comment with your email address below. ** Please remember to leave your email address with your entry. That is mandatory to enter into the giveaway. Be the first or last one to enter and get an EXTRA entry!! The random entry will be drawn on November 17th and announced on this post. I will notify the winner via email. The winner will need to reply to me within 72 hours of this announcement/email. If there is no response, a new winner will be drawn. Disclosure: Melissa & Doug will be compensating me for this post with free products. All posts reflect my personal opinion and endorsement and are not swayed by compensation and/or free products. Please note that this post reflects my opinion and preferences and you might not share that same opinion. I love all Melissa & Doug toys, but my son has been wanting a trunki. My daughter is getting a Baby Alive doll and I might not even hide the "real" food that you can feed the doll. Wow! We love Melissa and Doug products too! WOuld love to win! My daughter is getting her very first American Girl doll...Caroline! My son would love the wooden train set. My son will be getting a radio flyer tricycle. We would really love a trunki! We travel so much to visit my family, and it would be so much fun to have. Mellissa & Dough toys are durable and educational. "acpham@hotmail.com"
We are getting our son a kid table for his room to play on, draw, and use for years to come! I love the wildlife rescue sorting truck! I have the give away on my blog as well. I added you to my list on the post. My favorite item on the Melissa and Doug terrific twenty list is the bus! My girls are obsessed with the Wheels on the Bus song and all things school buses. I plan on giving my kids some simple toys - new coloring books and puzzles. Love the wooden train set---my boys are obsessed with trains! I'm looking at buying my boys a little ball pit to keep them busy during the winter months! Love Melissa and Doug. My e-mail is inspirationlaboratories@gmail.com. We plan on getting him a bike with training wheels for Christmas! The train tunnel with appearing treasure looks so cool! My girls would also love the Doorbell House or the Safari shape sorter. My girls like My Little Pony, so they're getting a few of those for Christmas this year. I love the scratch art portable light table. I'm going to get my daughter a kid's accordion. She played with one in a toy store and loved it. 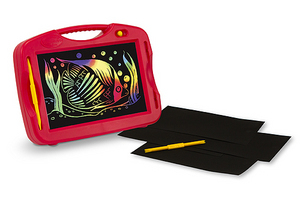 I'd love to win the scratch art doodle board. pragmaticmomblog (at) gmail (dot) com. 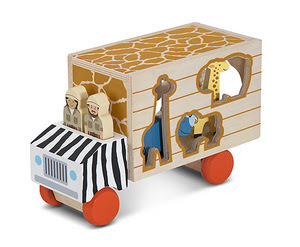 My favorite Melissa & Doug toy is the wildlife sorting truck! I'm getting my Chiquita shoes that squeak when she walks for Christmas. My email address is n.harber@yahoo.com. My daughter would love the Big Rig Building set! I love the Post Office set; I think my oldest daughter would love playing pretend with it. My daughter would love the doorbell house. The other gift we plan to buy our daughter is a doll house. Melissa and Doug are some of my favorite toys for my kiddos. I like the grocery basket on the top twenty list. We are looking at getting the blocks also by Melissa and Doug for Christmas. My favorite item on the Terrific Twenty list is the Melissa and Doug Fairy stamping set. My daughter would love that!! I'd love to win the mailbox set for my kids! My daughter would love the wildlife rescue sorting truck! What a great giveaway! Melissa and Doug toys are wonderful! My favorite is the Animal Rescue Shape-Sorting Truck Wooden Toy. Another toy I plan to give my grandson is Tank from Dinosaur Train... the InterAction figure. Email: brandigandy(at)gmail(dot)com thanks for the giveaway! My favorite Melissa and Doug toy is the big rig building truck. It sounds a little geeky, but for my three-year-old, I think I'm going to get him his own comfy chair and create a little reading corner for him in his room. He loves looking at books. Would love this for my son! Thanks for the chance! I got my son a Little Tikes basketball net! I love this giveaway. Thank you! From the 2o list my kids would love the Let's Play House! Grocery Basket with Play Food. It would be a great addition to our play kitchen. Another item on my kids Christmas list is the Melissa and Doug wooden cookie baking set. my children would love the whittle world wooden school bus! I like the metal grocery basket. My 7 year old son wants Lego Batman 2 for Christmas. We plan to give the kids the Melissa & Doug floor easel (to share) for Christmas. My son would love the Big Rig building set! My email address is tabitha(at)meetpenny(dot)com. Thanks for the entry. My older boys are getting an air hockey table. I love the doorbell house! Our favorite item on the terrific twenty list is the Big Rig Building Truck! We are also getting our son his yearly Christmas book! love the magic mine train tunnel! we're planning to give a tool bench! The Big Rig Building Set looks pretty cool! I love Melissa and Doug products!! We're also planning on getting Legos this year. Our girls don't have any!! I love the Rattle Rumble Push Toy!! I have a one year old and I got her a Little Tikes Cozy Coupe car! I'm SO excited to give it to her! We have a 5 year old and she is getting a dreamlights and my son (2) is getting a Thomas engine to replace a lost one...its all he wants this year! We love all Melissa & Doug toys, but my girl has been wanting a trunki. My daughter is getting a big girl bike !! 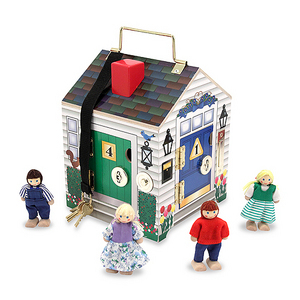 Love Melissa and Doug, i'd want to get the Trunki but my toddler would probably pick the doorbell house or mail toy. Love the scratch art light box and the Trunki! My daughter is definitely getting a Trunki for Christmas as we have holiday travel coming up. Love the doorbell house best! Art supplies of all types will be under the tree this year. Their art supplies are my favorite! I love simple, educational toys! I like the trunki and the train set. I plan to give my son some kid-sized tools for using at his work bench. Love Melissa and Doug doorbell house! Use it to encourage pronouns!! My son would love the school bus set or the mailbox set. Both are fun imaginative toys! Sarah.bajorek@gmail.com. We love Melissa and Doug toys! The trunki and train set look great. I plan to give my little one art supplies. I like the Rattle Rumble Push Toy. I love the Trunki Suitcase! My son is getting a basketball hoop!